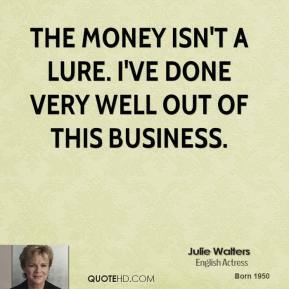 [Mrs. Wilkinson is a] disappointed woman on every level, ... She's jaded. 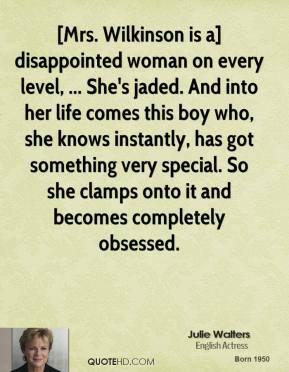 And into her life comes this boy who, she knows instantly, has got something very special. So she clamps onto it and becomes completely obsessed. These kids feel like they've been disrespected all year considering what they've done. We've gone unnoticed. We have great heart and good work ethic. They weren't ready to be done. John's been steady for us and has played his heart out. It is his senior year and I can't say enough good things about him. 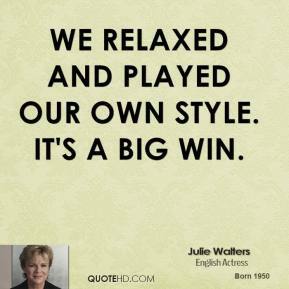 We relaxed and played our own style. It's a big win. It's just a really rich feeling on so many levels. I absolutely couldn't be more proud of this team. We've had quite a bit of adversity this year. 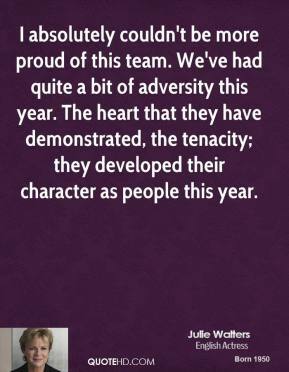 The heart that they have demonstrated, the tenacity; they developed their character as people this year. We played some really strong competition and made a point to do some bonding during the experience. 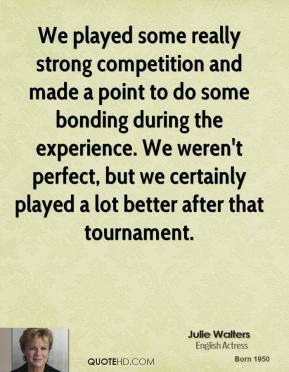 We weren't perfect, but we certainly played a lot better after that tournament. Both my parents died from smoking, so yes, I absolutely agree with the policy. It's nice for me not to have to worry about secondhand smoke here anymore. 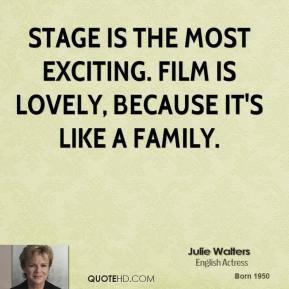 Everyone comes up to me saying, 'Cooee, Julie! Hello!' as if I know them. Of course I don't bloody know them. 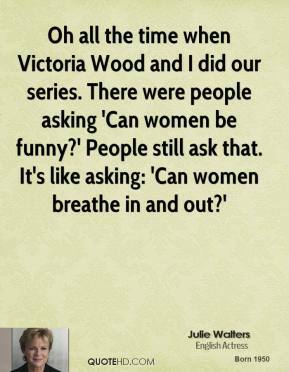 Am I flummoxed by it? Sometimes. 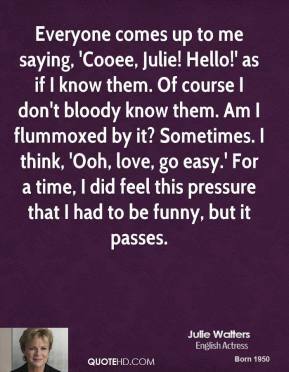 I think, 'Ooh, love, go easy.' For a time, I did feel this pressure that I had to be funny, but it passes. I remember Michael saying, 'Rich and famous? It's much better to be just rich'. I didn't quite get it to begin with. But he's right. 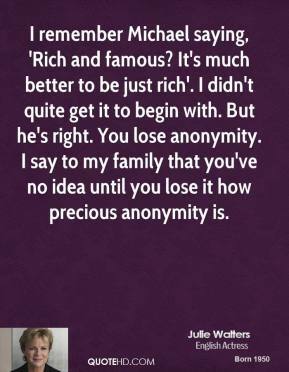 You lose anonymity. I say to my family that you've no idea until you lose it how precious anonymity is. I was the little, funny one. 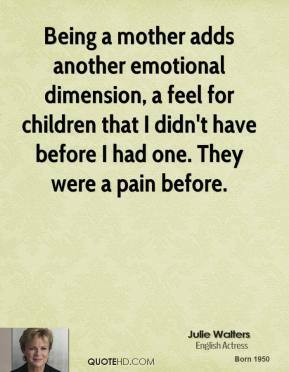 I felt I was the child among grown women. 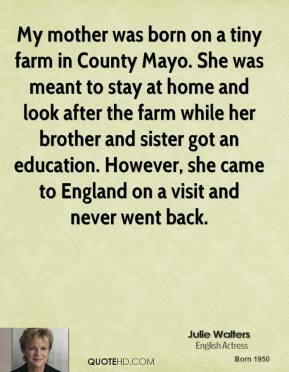 I'll tell you how it happened. The phone rang. 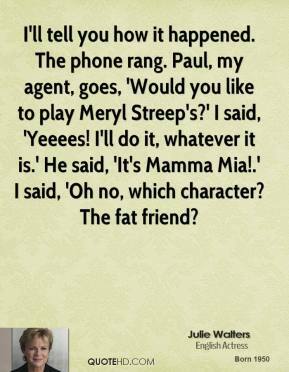 Paul, my agent, goes, 'Would you like to play Meryl Streep's?' I said, 'Yeeees! I'll do it, whatever it is.' He said, 'It's Mamma Mia!.' I said, 'Oh no, which character? The fat friend? 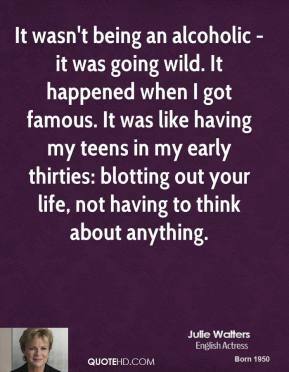 It wasn't being an alcoholic - it was going wild. It happened when I got famous. 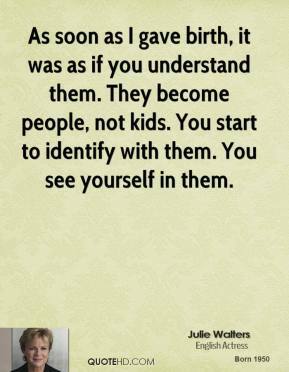 It was like having my teens in my early thirties: blotting out your life, not having to think about anything. It's bloody great to get to fifty-five. 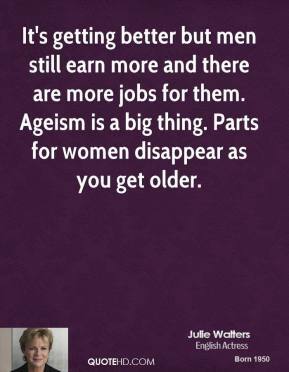 I've never been bothered about people knowing how old I am. 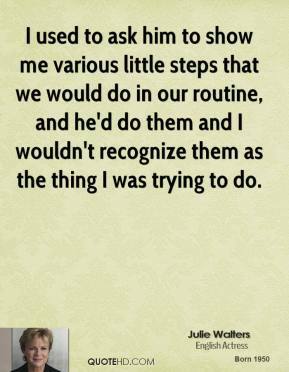 I used to ask him to show me various little steps that we would do in our routine, and he'd do them and I wouldn't recognize them as the thing I was trying to do. One girl's father offered to take the pictures and we all worked together to come up with the themes for each photograph. 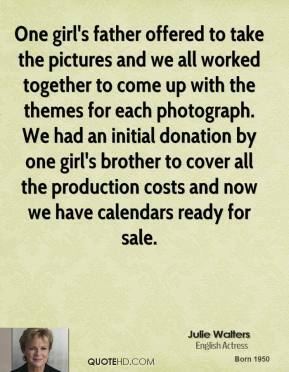 We had an initial donation by one girl's brother to cover all the production costs and now we have calendars ready for sale. I was given the book to read first of all and I found it totally inspiring, arousing and very moving. I literally couldn't put it down. 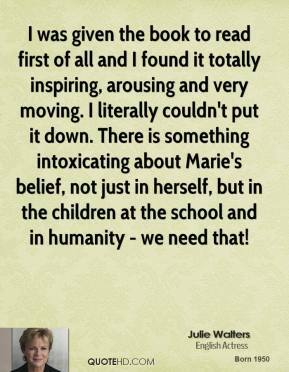 There is something intoxicating about Marie's belief, not just in herself, but in the children at the school and in humanity - we need that!